This syndrome is caused by a mutation in BRCA1 or BRCA2 genes. The general population incidence of hereditary breast/ovarian cancer syndrome is about 1 in 800 but can vary by ethnic background. The population incidence in Ashkenazi Jews (Eastern European) is about 1 in 50. Those women with a known mutation in one of these two genes have a lifetime risk of 50-85% for breast cancer and a 10 to 40% risk of ovarian cancer, depending on whether they have mutations in BRCA1 or BRCA2. Men have a 6% risk for breast cancer. Both men and women are at risk for other types of cancer depending which gene is affected. Cancer genetic counseling and testing services are available in Canada; refer to the Canadian Association of Genetic Counsellors’ website for a genetics clinic in your area. Uncertain if your patient’s family history is high, moderate or low risk for hereditary breast and ovarian cancer? See the Canadian Cancer Society’s hereditary breast cancer risk triage tool (54.3 KB pdf file). This syndrome is caused by mutations in the MLH1, MSH2 and MSH6 genes. The general population incidence of HNPCC is approximately 1 in 3,000, though this number is thought to be an underestimate. When a mutation has been identified in one of the HNPCC genes, the lifetime risk for colon cancer is 70-80% and there is increased lifetime risk for other cancers: endometrial (20-60%), gastric (13-19%), ovarian (9-12%), hepatobiliary tract, urinary tract, small bowel and CNS cancer. Cancer genetic counseling and testing services are available in Canada; refer to the Canadian Association of Genetic Counsellors’ website in the resource section for a genetics clinic in your area. This syndrome is caused by mutations in the APC gene. The general population incidence is 3 in 100,000 or 0.5% of colon cancers. The lifetime risk for colon cancer is 100%. For individuals with classic FAP, colectomy is recommended after adenomas emerge and prognosis for long term survival is good. For more information about syndromes see our Hereditary Colorectal Cancer PowerPoint educational module (1.9 MB PowerPoint file). 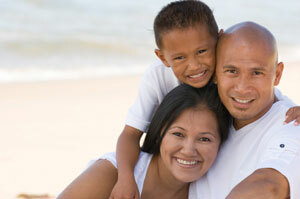 Uncertain if your patient’s family history is high, moderate or low risk for colorectal cancer? See the Canadian Cancer Society’s colorectal cancer risk triage tool (73 KB pdf file). This syndrome is caused by mutations in CDK4, CDKN2A (p16), and CMM genes. Mutations in these genes account for 8-12% of all melanoma cases. The lifetime risk of developing melanoma varies by skin type, sun exposure and geographic location. This syndrome is caused by mutations in the RET (MEN type 2) and MEN1 (MEN type 1) genes. The prevalence of MEN types 1 and 2 is approximately 1 in 30,000. The syndrome is characterized by tumours of the parathyroid, medullary thyroid, pituitary and pancreatic islet cells, and pheochromocytoma. No major high-risk susceptibility genes have been identified for prostate cancer. Ongoing research has identified several low-risk susceptibility genes. These susceptibility genes interact with environmental and other risk factors leading to the development of cancer. A resource for Australian family physicians. A statistical calculator of a person’s risk of being a carrier of an inherited breast cancer mutation. Patient information about a variety of different cancers including diagnosis, screening, treatment and management. Standards/guidelines, prevention/screening treatment and research. From the University of Montreal, Inherit BRCAs consists of a forum of experts in molecular and clinical genetics, genetic epidemiology, population health, genetic demography, psychosocial evaluation, healthcare and health sciences evaluation, ethics and public law. Patient and health care professional information. Genetic counseling services available. Health care provider and patient information about types of cancer including screening, treatment and genetics. Cancer treatment guidelines, clinical trials, etc.